This contribution comes from Dr. Thomas Doppler, who is based at the University of Basel, Switzerland, at the Integrative Prähistorische und Naturwissenschaftliche Archäologie (IPNA) (Integrative Prehistory and Archaeological Science) and the Department of Environmental Sciences. We’ve also added the IPNA to our list of stable isotope facilities-get in touch if we’re missing yours! The project (April 2013 to March 2016, based at the University of Basel, Switzerland) aims at studying cattle economy and cattle management on one hand and human impact on the red deer population on the other, as represented in the archaeology of the Swiss lakeshore dwellings. Organic remains are well preserved at the site of Arbon Bleiche 3. Photograph: © Amt für Archäologie Thurgau, Daniel Steiner. These dwellings – dated between 4300 and 2400 BC – have the richest and most detailed archaeological record in Europe, and provide a unique background for the examination of models of subsistence, intensification, cultural adaptations to climatic changes and human impact to the prehistoric environment. 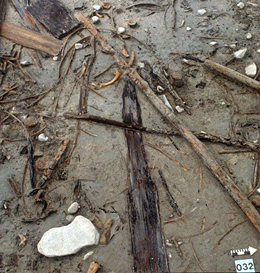 Waterlogged deposits have preserved many organic remains such as wood, seeds, animal dung; and hundreds of thousands of animal bones have been recovered. Based on dendrochronology the archaeological finds can be dated precisely at least to decades but even to single years, allowing a longitudinal study with unprecedented time resolution. 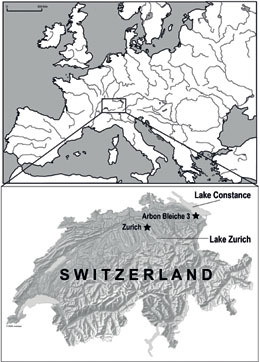 We focus our research on the eastern area of Switzerland, especially on the lakeshore settlement of Arbon Bleiche 3 at Lake Constance and sites in the lower Lake Zurich region, where vast and well documented archaeozoological collections cover a long chronological sequence of settlements in a small and clearly defined region. Map showing the location of the study sites in Switzerland, including Arbon Bleiche 3 at Lake Constance and a range of sites in the lower Lake Zurich region. Figure: © IPNA, Thomas Doppler. The research questions will be addressed using carbon, nitrogen, oxygen and strontium isotope analyses on animal bones and high-crowned cattle and deer molars.